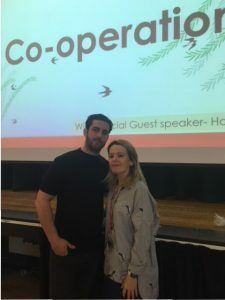 ​On Friday Willow House were lucky enough to have a very special guest speaker in their assembly. 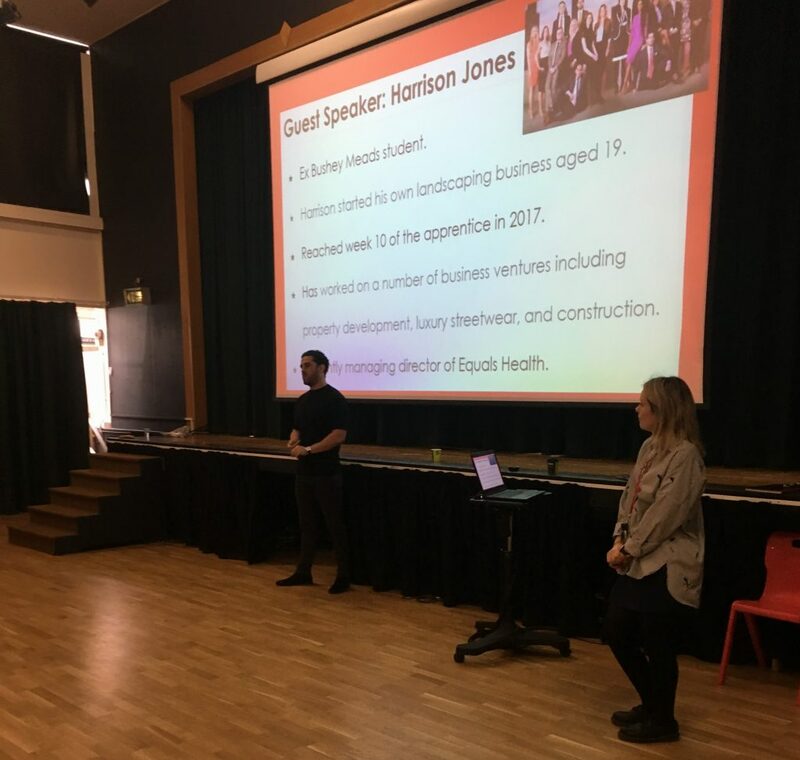 Harrison Jones is a local business man, who is most well known for being a contestant on the most recent series of The Apprentice, and who made it through to week 10 competing for an investment in his business plan from Lord Alan Sugar. Harrison is an ex student of Bushey Meads, and very kindly agreed to talk in one of my House assemblies. I thought it would be interesting, and perhaps inspiring for our students to see what can be achieved after leaving our school. Harrison left Bushey Meads at the age of 16 and started his own landscaping business with a friend. Following that he has set up a range of businesses, from leisure wear to construction, and is now managing director of Equals Health. This is a healthy eating brand aiming to provide convenient, healthy, Michelin star quality food to businesses, organisations and homes across the U.K. Many students are fans of the show, and while setting up for the assembly we had many excitable students approach Harrison for photos and autographs. 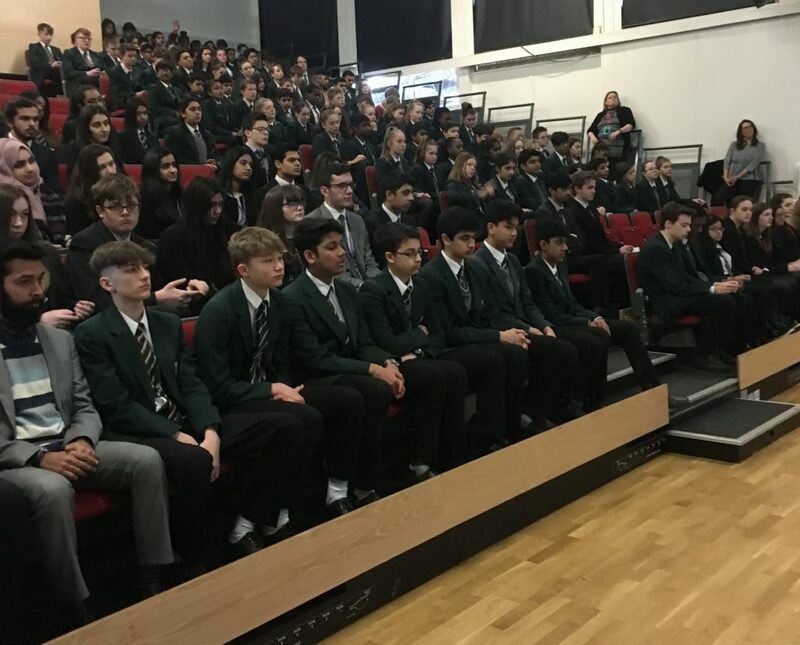 As well as Willow House, year 10 business students came along, as they had been watching the program as part of their lessons, and were excited to have the chance to put their questions to one of the stars of the show directly. During the assembly students asked Harrison questions about how to be a successful entrepreneur, and about his time filming the show. Alan Sugar is not as scary as he appears- although he is not happy doing more than two takes of the same line! Harrison went through 15 interviews to get his place on the show. Contestants are constantly filmed from around 4am until 10pm during the tasks, and the footage is cut down to a matter of minutes, so the editing plays a huge part in the way you see the tasks unfold. They really do have their suitcases packed when they arrive at the boardroom! As well as getting a glimpse into the production of the show, Harrison had some very inspiring tips for our students. One that particularly stuck with me is- what you are worrying about, probably wont happen. Harrison joked that he had been worried about the students pelting him with oranges during the assembly- which obviously didn’t happen, but just goes to show that even someone who has had to pitch on television in front huge multi million pound investors, and in front of over 6 million viewers watching at home, will still get nervous. And that is nothing to be ashamed of, but just remember that what you are nervous about will pass, and the things you are dreading happening probably won’t! He also spoke about the power of self belief, and how far determination can get you. He said that when he was at school he didn’t have that belief, but that it is something he has built up over time, and has mastered as an adult. I think that is a really important message. Mental strength and resilience is not something that just happens, it has to be learnt, and built up over time. Training yourself to believe in yourself, and to see the positive in a situation is very important, and can take years to master. I think this is a particularly poignant message, and one that can benefit all of our students. I found the talk very inspiring. I hope that it provided some motivation for Willow house, and confidence that they can achieve great things if they believe in themselves, ignore the nerves, and go for their goals. Willow house have cast their votes to choose our House charities, and as they are the last house to vote we now have a result! When choosing our local charity it was an extremely close call between The Peace Hospice, and New Hope. However with 52% of the votes New Hope just about came out on top, and will be our local charity for this year. Our national charity, with huge 72% of votes cast, is going to be Cancer Research UK. So many of our students will know someone who has been affected by cancer, and as a result this has been a hugely popular choice. We are aiming to organise our first fundraiser very soon- look out for an update in next weeks house article!